Does Your Home Feel Like It’s Lacking Something? Here’s Some Of The Best Ways To Refresh The Space! When you invest in a property, you have big dreams for it. Your mind is packed full of idea after idea; you’ve got so many hopes and dreams for the space. However, sometimes life gets in the way, and your home ends up not being as well designed and decorated as you expected it to be. It’s a lovely house and somewhere that you love, but it feels like it lacks a little something - could it be style? If you haven’t fulfilled your home’s full potential, in terms of decor, now is the time to change that. The good news is that doing up your home and breathing a little bit of new life into it isn’t as difficult as you would think. Neither is it as expensive as you might think. The truth is, if you know how to go about it, you can transform your home quickly, effectively, and on a low budget. Here’s a few tips, tricks, and ideas, for doing that, and creating a home that you can be proud of. Take these on board and implement them and you can make your home as beautifully decorated and stylish as you always dreamed it would be. The most important step to take when it comes to breathing new life into a dull, drab home is to take the time to get inspired. If you don’t have a creative streak and are stuck for design ideas, getting inspiration is crucial. By taking the time to look at the updates other people have made to their homes, you can get some ideas for your own home. If there’s a certain style of decor that you like, research inspiration and ideas for recreating it. Take the time to look for inspiration for the small details, as well as for the larger things. For example, the door handles that you use are just as important as the color scheme and style of furniture that you incorporate. Create mood boards, save your ideas and come up with a plan for each area of your home that you want to change. The biggest mistake you can make when it comes to home updates is trying to do too much at one time. If you want to successfully, add more style to your home, it’s important to start with one room and then once that’s been done up, move onto the next one. This will make the process less stressful, as you’ll only have one area to focus on at a time. The best thing to do is write up a plan for each space that you want to renovate and then put them in order of what you want to do first. It pays to think this through carefully, to ensure that you get the order right. Say, for example; you plan on doing up your hallway, living room, and bathroom. It would be best to start with your bathroom, then do your living room, and then the hallway. This will help to keep your hallway nice after it’s been updated. Your best bet when it comes to upgrading a room is to choose a theme and style for it. This makes the process easier as you have a certain style of design to work with, as well as a suitable color scheme. If you don’t have these things, it can be almost impossible to create a space that you love. If you’re unsure what style and theme you want to use in each room, take the time to think about it. Have you ever seen a beautiful living room and fallen in love with it? Was there a bathroom you visited that you instantly loved? If so, take ideas from that. Ask yourself, what was it about that space that you were so keen on? This is important, as it will help you to recreate it in your own home. Was it the color that you loved? Were you obsessed with the style of furniture? Or, was it something else that made it so special? Take the time to work out why you loved that space so much. A simple way to upgrade a room and make it look and feel vastly different to before is by adding focal points. These can be pieces of furniture, unique ornaments, or structural changes, depending on what look you want to create. If you want to add a sense of glamor to a room, adding molding to the ceiling or walls can be a great option. This gives the room an added touch of elegance and class, and also, adds personality to the space. The great thing about adding focal points is that they really can make a big difference to how stylish an area of your home looks. 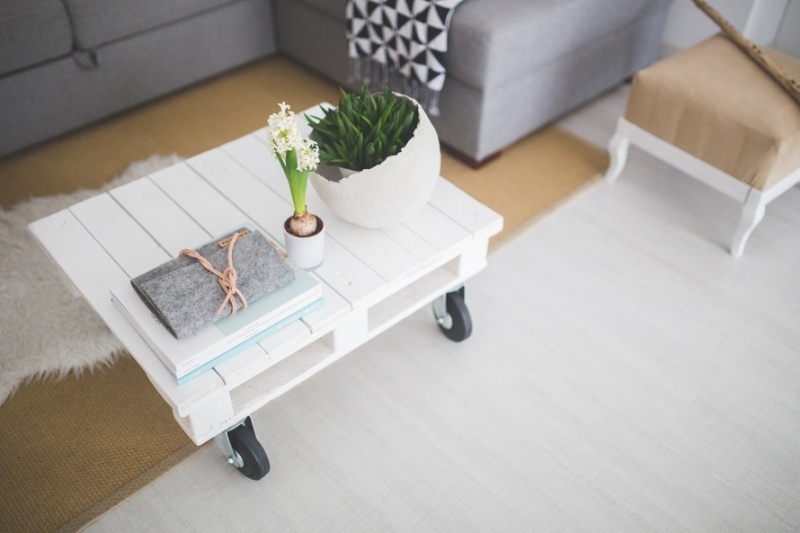 This might seem too simple to make a difference, but the truth is, rearranging your furniture can actually have a big impact on the look and feel of a space. Feng Shui isn’t a big thing for no reason, you know? Moving around your furniture and finding better ways to align it can have an impact on the look of the space. As well as on the feel of it and the vibe it gives off. Instead of just moving furniture around in the room it’s in, consider moving pieces from one room to another. You never know, the cabinet you’ve always kept in the kitchen might look amazing in your living room. Or, that table you’ve always had in the hallway might look fantastic in the bathroom. It’s a case of trial and error and seeing what works well in each space. Is your chipped, peeling furniture bringing down the vibe of your home? The obvious answer would be to buy new pieces. However, furniture doesn’t come cheap, so the chances are, you can’t afford to invest in all new pieces. The good news is that there are lots of ways you can revive old, scruffy looking pieces, it’s just a case of being willing to take the time to do so. For soft furnishings, recovering them is the best option. For metal or wooden pieces, painting them with a special paint can work well. Just make sure to take into account the theme of the space, before choosing a paint color. Above, I mentioned that it’s not just the big things that have an impact but also the little things. With that in mind, a great way to revamp any room is to upgrade the lighting. You may not realize it, but the lighting you have in a room can make a big difference to the look and feel of it. Swapping the lights could simply mean changing the lamp shades. Or, it could be something more extravagant, such as having a chandelier installed. If possible, swap all switches for dimmer ones, so that you can control how much light the space has at night. This helps to create a warmer and more welcoming look and feel. You may need to hire an electrician to help with this as dimmer switches can be tricky to fit. If you attempt to fit them yourself, and anything goes wrong, Electrical Connection has details here that you can use to get a quote. One of the easiest ways to refresh your home is with a selection of well thought out accessories. Believe it or not, a few stylish pieces that work well with the theme of a room, can make a big difference to the look and feel of it. And so, accessories can be a fantastic way to give your home a fresh look and a stylish vibe. Regardless of what room you’re focusing on, a selection of accessories is a must. From rugs and pillows to pictures and ornaments, there are plenty of pieces to choose from. The major pro of using accessories to change up the look of a space is that they tend to be more affordable than other ways of updating it. So, if you’re on a tight budget, accessories are perfect. If, when you look around your home, you’re not pleased with what you see, you need to make some changes. The fact is, your home should be a space that you love. It should be designed and decorated in a way that appeals to you and makes it somewhere that’s enjoyable to be. If that’s not the case, take note of the tips and ideas above, and make time to refresh your home. It might require a small investment, but it’s worth doing, as you’ll feel much better for it. Everyone deserves a home they love, so it’s important to upgrade yours if it’s not as nice as it could be. Get inspired, make a plan, and get to work - you can transform your home in no time.